Well Snoqualmie Valley commuters, specifically those who commute to the Seattle area on I-90, the topic is back. It’s time to start talking about tolling on I-90 again. The Washington State Department of Transportation says they’ve seen an 11% rise (or 15,000 more cars each day) in traffic over the I-90 floating bridge between Seattle and Bellevue since tolling began on 520 in December 2011. State Legislators say it’s time to re-start the discussion about possibly adding tolls to I-90 (between Bellevue and Seattle) to help balance traffic between I-90 and SR 520 and to generate revenue to fill a $1.4 billion construction funding gap for work on 520. So they want to hear from residents, whether it’s good or bad, because the EA helps with the decision-making when it comes to this potential tolling project. 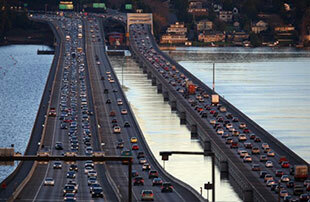 The 30-day public comment period on the tolling of the I-90 floating bridge runs January 22 – February 22nd, 2013. There are three public meetings you can attend next week to learn about the project, talk to project members and comment in person. Each meeting is from 4-7PM. Tuesday, Jan. 29th at Mercer Island Community Center, 8236 SE 24th St., Mercer Island. Wednesday, Jan. 30th at Bellevue City Hall, 450 11th Ave. NE, Bellevue. Thursday, Jan. 31th at Yesler Community Center, 917 E. Yesler Way, Seattle. You can comment online – probably the easiest method for Valley residents – at http://www.wsdot.wa.gov/tolling/i90/onlinescoping. All project materials are available to view online as well. You can comment by email or traditional mail: I90EAcomments@wsdot.wa.gov or by writing to Ms. Angela Angove at 999 Third Avenue, Suite 2200, Seattle, WA 98104. Make sure your mailed comments are postmarked by February 22nd. In November there will be a public hearing to share the findings of the environmental assessment – and another chance for public comment. The final environmental document should be completed by late 2013. It’s my understanding, from the last time this was brought up, is that it is illegal under current state law for the state to toll the I-90 bridge to pay for another bridge. Part of that concern stems from the idea that the state could keep the toll indefinately, meaning, even after the new 520 bridge is complete the toll remains in place to help pay for other projects (because there will always be other projects).